Article 1: Rome is the seat of the government of the Aristotelian, Roman and Universal Church, collectively called the Roman Curia. It is composed of various institutions: the Pope, the Sacred College of Cardinals, the Dicasteries and the Pontifical Consistories. Article 2: In the exercise of his supreme, full and immediate power over the Universal Church, the Roman Pontiff administers the Dicasteries, the Consistories and the Offices with the help and through the intermediaries of the Cardinals, Chancellors, Vice-Chancellors, and Prefects; it is in His name and His authority that they fulfill their responsibilities. Article 3.1: All Offices are under the tutelage of the Dicasteries or Congregations to which they are attached. Article 3.2: Each Dicastery is headed by a Chancellor. A Vice-Chancellor may be appointed to assist him. They are both Cardinal-Bishops. Article 3.3: Within each Congregation, the Chancellor and the Vice-Chancellor share tasks by mutual agreement and have equal rights. However, in order to ensure the proper functioning of the Congregation, the Chancellor ultimately has the primacy over the Vice-Chancellor in the event of disagreements over decisions or the management of the Congregation. Article 4: The Sacred College of Cardinals, known as the Sacred College, is the highest collegial organ of the Aristotelian, Roman and Universal Church. It includes all the Cardinals, regardless of their nature or charge, and assists the Pope in the governance of the Church. Article 4.1: The Sacred College takes its decisions by consensus or by vote. Article 4.2: The votes, launched at the Sacred College, have a standard duration of 5 days. Article 4.2.1: All decisions taken at the Sacred College are made by an absolute majority of the votes cast. - If the total number of votes cast is even: half of the total votes, plus 1. - If the total number of votes cast is odd: half of the total votes rounded up to the next higher number. - In all cases, blank votes or abstention votes are deducted from the total number of votes cast to establish the majority threshold. - A blank vote is a vote of abstention. Article 4.2.2: Any decision that is up to a vote must include the choice "abstention". Article 4.2.3: Any decision that is up to a vote which includes different choices than "agree or disagree" must obligatorily include the choice "against all proposals" in addition to the choice "abstention". Article 4.2.4: A second ballot is only organized if an absolute majority has not been reached in the first ballot. The proposals put to the vote are necessarily those which can obtain an absolute majority during this second ballot. Article 4.2.5: A third ballot is only organized if an absolute majority has not been reached in the second ballot. Only the two proposals with the most votes in the second ballot are put to the vote. The third ballot follows the rules laid down in the articles 4.2.2 and 4.2.3. - the election of the Pope (if applicable) requires a quorum equal to or greater than two-thirds of the Cardinals designated as electors in that election. - the election of the Dean (see details within article 7.1). Article 4.2.7: The abstention votes are counted in the calculation of the quorum. Article 4.3: The voting time may be reduced to 24 hours in the case of an urgent measure or increased to 10 days in the case of an important measure. Article 4.4: The urgent or important nature of a measure is the responsibility of the Dean or Vice-Dean of the Sacred College. Article 5: Any linguistic zone with more than 4 dioceses or 10 parishes is elevated to the rank of geodogmatic zone. However, the Sacred College or the Pope can anticipate this elevation and grant the rank to a smaller linguistic zone if the need arises. Article 5.1: A linguistic area is composed of parishes whose members speak the same language or related languages. Article 5.2: A geodogmatic zone is directed by a Pontifical Consistory. Article 5.3: Linguistic areas that are too small to become geodogmatic areas are directly controlled by the Curia who may, if necessary, appoint a papal legate to send to the area. Article 5.4: The Curia can also temporarily attach a linguistic zone to a nearby geodogmatic zone, or provisionally gather several linguistic zones in a single geodogmatic zone. Article 6: The Pontifical Consistories are linguistic collegiate subdivisions of the Sacred College. They have authority on the geodogmatic zone for which they are responsible. Article 6.1: Each Pontifical Consistory is composed of a variable number of Cardinals, their nature being equally variable. Article 6.2: Each Pontifical Consistory has a Cardinal-Deacon for each complete groups of eight parishes, with a maximum of four Cardinals. Article 6.3: The Pontifical Consistory with less than three Cardinals can be integrated by Cardinals of all kinds, chosen by the Curia according to their linguistic skills, to assist the Consistory and provide punctual assistance. Article 6.4: From 19 parishes or 7 dioceses, one of the Cardinal-Deacon seats is elevated to the rank of Cardinal-Priest seat. There can be only one Cardinal-Priest per Pontifical Consistory. Article 6.5: The mission of the Consistories is to maintain the unity of the Church within their zone, while integrating to the latter the linguistic and cultural specificity of the faithfuls under their jurisdiction, in accordance with the Dogma and Canon Law. Article 6.6: The Pontifical Consistories can legislate and have decision-making authority within their zone in different areas of specific competences, specified especially in matters of dissolution and annulment of marriages, bastardy, excommunication latae sententiae, relation with the Episcopal Assemblies, conflict resolution and peace negotiation. Article 1: The Sovereign Pontiff, or Pope, as the direct representative of God on Earth, is the supreme leader of the Aristotelian, Roman and Universal Church. He possesses the ordinary, supreme, full, immediate and universal power which he can always exercise freely. He edits and promulgates the papal bulls which have perpetual and irrevocable value. Article 1.1: If it happens that the Sovereign Pontiff renounces his office, it is required that the renunciation be made freely and that it be duly manifested, but not that it be accepted by anyone. He becomes Pope Emeritus. Article 1.2: In case of severe incapacity, physical or mental, he may be removed from his function by the Sacred College, by a two-thirds majority vote, and be appointed Pope Emeritus. Article 1.3: The Pope Emeritus loses all his powers, but remains an important counselor of the Church in dogmatic matters, except in cases of mental incapacity. The efficient cause= He is appointed by the College of Cardinals gathered in a Conclave. The formal cause = He is enthroned by the Dean or Vice-Dean of the Sacred College. The final cause = He is the supreme authority of the Church and presides over the Sacred College. Article 1.5: The medallion of Aristotle is gold, surrounded by a laurel wreath of the same. Article 2: The Cardinals compose the Sacred College; they are divided according to their nature and their status in three orders: the episcopal order, the presbyteral order and the diaconal order. Article 2.1: All Cardinals are awarded a titulus, or title, when they are created; by this title, they also receive jurisdiction over the church of Rome to which he refers. The Cardinal-Bishops receive, in addition, the charge of an episcopal sine cura seat. Article 2.1.1: The Cardinal Emeritus are awarded a new titulus, or title, upon appointment; by this title, they also receive jurisdiction over the church of Rome to which he refers. Article 2.2: The Cardinals act within the college and must validate, even a posteriori, their decisions by the Pope or the Sacred College. Article 2.3: The Cardinals can celebrate all the sacraments of the Aristotelian church. Article 2.4: The Cardinals are alone, apart of the Sovereign Pontiff, able to validate a separation or annulment of marriage. Article 2.5: The Cardinals are alone, apart of the Sovereign Pontiff, able to validate a defrocking, voluntary or not. Article 2.6: The title of a Cardinal does not prohibit cumulation with another office in the secular or regular clergy. Article 2.7: He can not be considered a soldier, although he may direct or command armies. Article 2.8: Cardinals who have been absent for more than one month, without warning of their absence, may be dismissed and, where appropriate, appointed Emeritus. - Absence, disappearance, retirement or retrenchment In Gratebus. Article 3: The Cardinal-Bishops direct a Dicastery or Congregation as Chancellor or Vice-Chancellor; their number is fixed at fifteen. Article 3.1: The Cardinal-Bishops have a universal charge; they have the right to vote at the Sacred College and a right of access to all the workrooms, Colleges and Institutions of Church's government. Article 3.2:Apart from the Sacred College debates, the Cardinal-Bishops have the right to block or suspend any decision taken - within five days of publication of the decision - or to be taken by a member of the clergy less than or equal in dignity, all positions mingled, in his own name or in the name of the Institution he represents. Any other Cardinal is entitled to seize the Sacred College or the Sovereign Pontiff to lift or cancel a Cardinal's blocking or suspension. e.g. : The right to block or suspend is an inherent right of the Cardinal's office. The Cardinals are the guardians of the Church. In this sense, they must see to the smooth running of the Holy Institution and the respect of the rules. The use of this right of suspension must, however, remain exceptional and always be applied in the general interest of the Church. Article 3.3: Any member of the Sacred College may propose candidates for the creation of Cardinals as Cardinal-Bishop, for the position of Chancellor or Vice-Chancellor of a Congregation. Article 3.4: The opinion of the Chancellor in office is taken into account in the choice of his Vice-Chancellor, in order to guarantee a good professional and mutual relationship. To this end, the Chancellor may veto the selection of candidates for the position of Vice-Chancellor of his Congregation, before the vote of the Sacred College. The material cause = He must be a titular bishop or hold another office with the rank of bishop at the time of his appointment. The efficient cause = He is appointed by the Sacred College or directly by the Pope. The formal cause = He is enthroned by the Pope, the Dean or Vice-Dean of the Sacred College. The final cause = He is a member of the Sacred College with the right to vote and directs the Dicastery or Congregation to which he is assigned. Article 3.6: The medallion of Aristotle is purple. Article 4: The Cardinal-Priests have for vocation to ensure the management of the geodogmatic zone for which they are responsible, as well as the proper functioning of their Consistory. Article 4.1: The Cardinal-Priests have a moderate charge, between the universal and the local, which extends over the geodogmatic zone; they have the right to vote at the Sacred College and a right of access to all the workrooms, Colleges and Institutions of Church Government. Article 4.2: Apart of the debates within the Sacred College and their Consistory, the Cardinal-Priests have the right to block or suspend any decision taken - within five days of publication of the decision - or to be taken by a member of the clergy of their geodogmatic zone being inferior in dignity, all positions mingled, in his own name or in the name of the Institution he represents. Any other Cardinal is entitled to seize the Sacred College or the Sovereign Pontiff to lift or cancel a Cardinal's blocking or suspension. Article 4.3: Any member of the Sacred College can propose candidates for the creation of Cardinals as Cardinal-Priest. Article 4.4: The Pontifical Consistories are entitled to propose, in a collegiate way, candidates for the creation of Cardinal for the seat of Cardinal-priest bound to the said Consistories. Article 4.6: The medallion of Aristotle is purple. Article 5: The Cardinal-Deacons have for vocation to ensure the management of their geodogmatic zone and are supposed to exercise their functions in the Consistory to which they are linked. Article 5.1: The Cardinal-Deacons have a mission of greater local importance; they are only entitled to speak within the Sacred College and their access is restricted within the palaces, Assemblies and Roman Colleges. Article 5.1.1: The Episcopal Assemblies are under the jurisdiction of the Cardinal-Deacons. Their access is not limitable by the Episcopal Assemblies. Article 5.2: Any member of the Sacred College can propose candidates for the creation of Cardinals as Cardinal-Deacon . Article 5.3: The Pontifical Consistories are entitled to propose, in a collegiate way, candidates for the creation of Cardinal for the seats of Cardinal-Deacon bound to the said Consistories. The final cause = He is a consulting member of the Sacred College. Article 5.5: The medallion of Aristotle is purple. Article 6: The Cardinal Emeritus only has the rights granted by another office, but he keeps an advisory seat within the Sacred College. Article 6.1: The Cardinal Emeritus maintains the nomenclature of Cardinal, augmented by the suffix Emeritus, according to the status he possessed during the exercise of his functions. The material cause = He must have been Cardinal for more than 12 months. The efficient cause = He is confirmed by the Pope or the Sacred College. The efficient cause = He is appointed by the College of Cardinals or directly by the Pope. The final cause = He is a consultant member of the Curia. Article 6.3: The absent Cardinal Emeritus loses his right to vote and access to the Sacred College. He can access it again by expressing his intention to participate in the work of the Sacred College; he may have the right to vote after 4 months of active participation. e.g. : The rules on absence are those above in Can. 5 P-II-2.9. Article 6.5: A special committee is formed within the Sacred College to evaluate the participation of the Cardinal Emeritus. Article 6.5.1: The special committee consists of three Cardinals who are not of Emeritus dignity, who are appointed by a collegial decision of the Sacred College. Article 6.6: The medallion of Aristotle is purple. Article 7: The Dean of the Sacred College chairs the Sacred College in the absence of the Pope and may speak on behalf of the College of Cardinals. He is accountable only to the Holy Father and to the Sacred College. He has no power of government over the other Cardinals, but he is considered the primus inter pares. Article 7.1: The Dean of the Sacred College is elected among the Cardinal-Bishops, by all the Cardinals. The Dean takes office on April 1st and October 1st, remaining in office until the date of the inauguration of the new Dean. Article 7.1.1: The election is held in the Chapel of Saint-Lescure, at least one month before the date before the entry into office for the new Dean. In case of delay during the election, the mandate of the outgoing Dean is extended until a successful election. Article 7.1.2: Any Cardinal-Bishop is eligible if appointed to his position for at least six full months at the time of the first round. Article 7.1.2.1: In the event that no candidate meets the conditions defined in the article 7.1.2, it is possible to extend the list of candidates to all Cardinal-Bishops, without condition of length of charge. In case this is still not enough, the list can be extended to the Cardinal-Priests, Cardinal-Deacons and finally to the entire Sacred College. Article 7.1.3: All eligible Cardinals according to article 7.1.2 (or 7.1.2.1) can submit their application. However, they have the option to withdraw voluntarily before each round. Article 7.1.4: All Cardinals, with the exception of the absent Emeritus, have the right to vote. Article 7.1.5: The election of the Dean can be carried out in a maximum of 4 rounds. To be elected, a candidate must receive an absolute majority of the votes. Article 7.1.5.1: A quorum strictly greater than fifty percent (50%) of the Cardinals eligible to vote is required for a first-round election. No more than 2 candidates may qualify for the fourth and final round, if it takes place. Article 7.1.5.3: When no candidate meets the threshold percentage of required votes, the two candidates with the highest percentage are qualified for the last round. Article 7.1.5.4: Ties are resolved by discarding as many candidates as necessary to meet the requirements of the previous articles, starting with the most recently nominated candidates to the Curia. Article 7.2: The Dean of the Sacred College cumulates the rights reserved to the Cardinal-Bishops in addition to his own. He is responsible for organizing the funeral of the Pope and is responsible for reassembling the Conclave for the election of the Sovereign Pontiff. Article 7.3: The Dean of the Sacred College appoints the Vice-Dean and determines his missions. Article 7.4: There can not be more than one Dean in office, the one who is in office loses his title upon the appointment of his successor. The material cause = He must be eligible according to canonical rules. The formal cause = He is inducted by the outgoing Dean or Vice-Dean. The final cause = In the absence of the Pope, he presides over the Sacred College. Article 7.6:The medallion of Aristotle is purple, surrounded by a crown of golden laurels. Article 8: The Vice-Dean of the Sacred College is the second representative of the Sacred College. He assists the Dean in his task, essentially intra muros, and is his substitute in case of absenc,e with all legal powers of representation, seat or vote. Article 8.1: The Vice-Dean of the Sacred College cumulates the rights reserved to the Cardinal-Bishops in addition to his own . Article 8.2: He is responsible for organizing the election of the new Dean of the Sacred College. Article 8.3: In case of the resignation or death of the Dean of the Sacred College, the Vice-Dean takes charge, finishes the mandate and taking the title of the latter. He then appoints a new Vice-Dean. Article 8.4: There can not be more than one Vice-Dean of the Sacred College in office, the one who is in office loses his title as soon as the new one is appointed. The material cause = He must be Cardinal-bishop in title at his appointment. The efficient cause = He is appointed by the Dean of the Sacred College. The formal cause = He is enthroned by the Dean of the Sacred College. The final cause = If the Dean is absent or incapacitated, he shall replace him with all legal powers of representation, seat or vote until the resolution of the Dean's incapacity. Article 8.6: The medallion of Aristotle is purple . Given in Rome, on the venerated grave of St. Titus, on the thirtieth day of January, the Wednesday, of the Year of Our Lord MCDLXVII, the first of Our Pontificate. Translation by H.E. Hull de Northshire. 2 A Religious Province is composed of the dioceses included in a single sovereign temporal power (kingdom, empire or other). Religious Provinces are defined by the Curia. 2.1 Any Religious Province with more than 4 dioceses of which 2 metropolitan is raised by the Curia to the rank of Primacy. However, the Curia can anticipate and can grant that rank from three dioceses. 2.1.1 A primacy is headed by an episcopal assembly including all the prelates of the concerned Religious Province. 2.1.2 A primacy is represented by a Primate. 2.1.3 Each primacy has its own statutes whose Curia verifies compliance with the Dogma and the Canon Law. 2.1.4 A primacy is competent to the administrative management of the Religious Province and for the appointment and the removal of bishops. 2.1.5 The primacies can legislate or can make decisions only in their areas of expertise and in accordance with the Canon Law. 2.2 Too small religious provinces to become primacies are headed by the highest prelate in the hierarchy. In case of ties, the Curia chooses one of the prelates concerned. 2.3 The Curia can also provisionally attach a Religious Province with any close primacy, or temporarily reunite many provinces in a single primacy. 2.4 The Curia can divide a Primacy in several vice-primacies, in order to facilitate operation. These vice-primacies then function exactly like primacies. In view of the increase of the number of linguistic zones raised to the rank of geodogmatic areas and to favour a better representativeness of these areas in the internal decision-making processes in the Curia, in particular by offering to more of them a voting right through the vote of the national cardinal elector, We, Cardinals gathered in Sacred College, ruled and ordered, and by our present edict perpetual and definitive, we rule and order the adoption of amendments relative to the Book 5 of the Canon law of the Aristotelian and Roman Holy Church bearing the title of De Sanctae Sedis summo administratione, defined and listed below. The amended articles override the articles of the Canon Law prior to the current edict. The main part of the modifications on the reduction in the number of parishes and dioceses required so that a pontifical consistory may have the benefit of a national cardinal elector. - Article 6.2 : Each pontifical consistory has a national cardinal suffragan for each count of ten parishes, up to a maximum of three national cardinals. - Article 6.3 : Each pontifical consistory has a national cardinal elector from 30 parishes or 10 dioceses. There can be only one national cardinal elector per pontifical consistory. - Article 6.2 : Each pontifical consistory has a national cardinal suffragan for each complete count of ten parishes, up to a maximum of three national cardinals. - Article 6.3 : From 20 parishes or 7 dioceses, the pontifical consistory receives an electorate, that is to say that one of the two national cardinals suffragan is elevated to the rank of national cardinal elector. There can be only one national cardinal elector per pontifical consistory. Given and confirmed at Rome by the Sacred College under the pontificate of the Holy Father Eugène V the XII of July, on Monday, of the year of grace MCDLVIII. Amendments written by His Eminence Aaron de Nagan, Dean of the Sacred College, published by His Eminence Cyril of Kad Azayes, archdeacon of Rome, on the twelfth day of the month of July, on Monday, in the year of grace MCDLVIII. Creation of five seats of "roman cardinal elector"
Are saying that from this day, the number of roman cardinals elector is increased from seven to twelve. Which means the number of congregations, more seven. In order to unite and streamline the different dicasteries of the Curia and of the Sacred College of cardinals, the latter decided to set up a real effective and rational structure allowing to optimize the services of these institutions. SInce the Great Floods of the years one thousand four hundred fifty and the Renewal of the Faith of the pontificate of the Most Holy Father Nicolas V, the Pontifical Chancellery, also called Roman Chancellery, without a clearly defined role, served as unifying dicastery without real Chancellor, or by default the Camerlengo unofficially, at its head. In order to give back its usefulness to the Roman Chancellery, and in order to establish some centralized unity in leading of the various and disparate services directly dependent on the Curia, We, Cardinals of the Aristotelian and Roman Church, gathered in Sacred College, ruled and ordered, and by our present edict perpetual and definitive, we rule and order the revision of the Book 5 of the Canon Law bearing the title of « De Sanctae Sedis summo administratione », defined and listed below. The modifief, amended of added canons prebail over the former Law following the publication of this edict. - Article 3.1 :The congregations are subdivided into different offices. These offices are under the supervision of the congregations to which they are attached. - Article 3.2 : Each congregation is led by a Chancellor, who is thereby a Roman Cardinal. - Article 3.3 : Each office is headed by a prefect or consul. - Article 3.4 : The Pontifical Chancellery or Secretariat of State is not considered as a congregation but as dicastery, an integral part of the Curia. - Article 3.4 : The Pontifical Chancellery or Roman Chancellery is considered as a fully-fledged congregation. At its head is a Roman Cardinal elector. However, the Pontifical Chancellery is not included in the accounting of the number of Roman Cardinals elector. Given and confirmed at Rome by the Sacred College under the pontificate of the Holy Father Innocent VIII, the twenty-first of the month of October, on Sunday, of the year of grace MCDLIX. Published by His Eminence Quarion, Cardinal-Camerlengo, the fifth day of the month of November, on Saturday, of the year of grace MCDLIX. To best represent the will of the Curia and the Sacred College gathered, it was decided by vote the amendment of the material cause for the election of the Supreme Pontiff, for which he will have to be Cardinal in charge at the time of the election, We, Cardinals gathered in Sacred College, ruled and ordered, and by our present edict perpetual and definitive, we rule and order the adoption of amendments relative to the Book 5 of the Canon law of the Aristotelian and Roman Holy Church bearing the title of De Sanctae Sedis summo administratione, defined and listed below. The amended articles override the articles of the Canon Law prior to the current edict. La cause matérielle = They must be a cardinal elector titular when he is appointed. There can not be another pope in office.. The efficient cause = They are appointed by the College of Cardinals elector, suffragan and emeritus. The formal cause = They are enthroned by the Camerlengo or the Archdeacon of Rome. The final cause = They are the highest authority of the Church and chair the Sacred College. The material cause = They must be a cardinal titular when he is appointed. There can not be another pope in office. Given and confirmed at Rome by the Sacred College under the pontificate of the Holy Father Innocentivs Octavvs the V of August, on Monday, of the year of grace MCDLIX. Amendments written by His Eminence Raniero Borgia said "Quarion" Cardinal Camerlengo, the Vth day of the month of August, on Monday, of the year of grace MCDLIX. In order to reward the sustainable investment of the whole of the cardinalis sanctæ romanæ Ecclesiæ contributing significantly to the building up of our Holy Mother the Church, whether they are roman or national, We, Cardinals gathered in Sacred College, ruled and ordered, and by our present edict perpetual and definitive, we rule and order the adoption of amendments relative to the Book 5 of the Canon law of the Aristotelian and Roman Holy Church bearing the title of De Sanctae Sedis summo administratione, defined and listed below. The amended articles override the articles of the Canon Law prior to the current edict. Article 9 : The Cardinal Emeritus only possesses the relative rights to another possible office, but keeps an advisory seat in the Curia and can celebrate all the sacraments of the Aristotelian Church. - Article 9.1 : The Cardinal emeritus has priority in elections to fill a vacant curial seat. La cause matérielle = He must have been a cardinal elector correctly and consistently for more than 6 months. The efficient cause = They are confirmed by the Curia for a period of 6 months. The formal cause = They are confirmed emeritus by the College of Cardinals. The final cause = They are a consulting member of the Curia. - Article 9.1 : The cardinal emeritus may be roman or national according to the status (roman or national) that they had during the exercice of their duties. - Article 9.2 : The roman cardinal emeritus has priority during elections to fill any vacant seat in the Curia. The national cardinal emeritus has priority during elections to fill a vacant national seat in the Curia. The material cause = The roman cardinal emeritus must have been a cardinal elector correctly and consistently for more than 12 months. The national cardinal emeritus must have been a cardinal suffragan correctly and consistently for more than 24 months. Given and confirmed at Rome by the Sacred College under the pontificate of the Holy Father Innocentivs Octavvs the VIII of May, on Tuesday, of the year of grace MCDLX. Amendments written and published by His Eminence Cyril Kad d'Azayes, Roman cardinal, the VIIIth day of the month of August, on Tuesday, of the year of grace. The custom undergoing the weight of the years which follow one another and moved it away a little more from where it was originally established by the Fathers of the Church, it appeared necessary to the Sacred College of the Aristotelian and Roman Holy Church to put in writing what it considered to be a custom became rule of law. The main part of the modifications consists to the addition of a lower arborescence to Can 5-I-4.2 et Can 5-II-7.1. - Article 4.2 : Votes started in the Curia have a normal period of 5 days. No quorum of participation is required to validate a decision. - Article 4.2 : Votes started in the Curia have a normal period of 5 days. *Article 4.2.1 : All decisions taken by the Curia are made by an absolute majority of the votes cast. - If the total number of votes cast is even : half of the total votes, more 1. - If the total number of votes cast is odd : half of the total votes rounded to theeven number directly upper, more 1. - In all cases, blank ballots or abstention ballots are deducted from the total number of votes cast to determine the majority threshold. - A blank ballot is an abstention ballot. * Article 4.2.2 : Any decision put to vote must include the choice "abstention". * Article 4.2.3 : Any decision put to vote, and ruling on a choice different to "for or against", must include the choice "against all proposals”, in addition to the choice of "abstention". * Article 4.2.4 : A second ballot is only held if an absolute majority was not reached in the first ballot. The proposals submitted to the vote are necessarily those which can obtain an absolute majority in the second ballot. * Article 4.2.5 : A third ballot is held if an absolute majority was not reached in the second ballot. The third ballot is necessarily the last. Only the two proposals which received the most votes in the second ballot are put to vote. The third ballot abides by the rules set out in Articles 4.2.2 and 4.2.3. - the election of Pope (if applicable) requires an equal or greater quorum of two-thirds of the cardinals appointed as electors in this election. - the election of the Camerlengo (for details see section 7.1 below). - the change of fundamental points of Dogma orCanon Law requires an equal or greater quorum of a third of cardinals elector. * Article 4.2.7 : The abstention ballots are counted in calculating the quorum. - Article 7.1 : The Camerlengo is elected by all the cardinals from among the Roman cardinals elector. for six months according to the rules defined by the Curia itself. - Article 7.1 : The Camerlengo is elected by all the cardinals from among the Roman cardinals elector. for six months. *Article 7.1.1 : Any Roman cardinal elector appointed to this last office at least six full months before the first round, is eligible. *Article 7.1.2 : All cardinals respecting section 7.1.1 are candidates for the office of Camerlengo. However, they may voluntarily withdraw before the first round of voting. *Article 7.1.3 : Any cardinal of the Roman Curia, whether he is Roman or National, elector, suffragan or emeritus, is elector. *Article 7.1.4 : If there are only two candidates, the voting is done in one round by the absolute majority of votes. *Article 7.1.5 : If there are more than two candidates, the voting is takes as many turns as needed until there are two final candidates. These ballots are won by a simple majority. The candidate (or candidates ex quo) who receives the fewest votes is eliminated systematically from the next ballot. N.B. : The term “won by a simple majority” means the proposal which received the most votes, regardless of the number of votes cast. *Article 7.1.6 :A candidate is elected automatically if they obtain an absolute majority based on the total number of those registered. *Article 7.1.7 : A minimum quorum of one-third of cardinals registered as electors is required in the ballot that sees a new Camerlengo elected. *Article 7.1.8 : If in the last ballot, no absolute majority is reached, a further ballot is held. Given and confirmed at Rome by the Sacred College under the pontificate of the Holy Father Innocent VIII the II of September, on Sunday, of the year of grace MCDLX. Amendments written and published by His Eminence Aaron de Nagan, Dean of the Sacred College and Archchancellor of the Apostolic See, the tenth day of the month of November, on Saturday,of the year of grace MCDLX, the eve of the feast of St. Martin. Have debated and decided that the canon law must attested and formalized any established fact ; so, we ruled and accepted, and by our present edict perpetual and definitive, we rule and order an amendment on the Book 5 of the Canon law of the Aristotelian and Roman Holy Church bearing the title of De Sanctae Sedis summo administratione, defined and listed below. The amended articles override the articles of the Canon Law prior to the current edict. Given and confirmed at Rome by the Sacred College under the pontificate of the Holy Father Innocentivs Octavvs the I of December, on Monday, of the year of grace MCDLXII. Amendments written and published by His Eminence Arnault d'Azayes, cardinal-camerlengo, the VIth day of the month of February, on Friday, of the year of grace MCDLXIII. Ruled and ordered, and by our present edict perpetual and definitive, we rule and order the adoption of amendments relative to the Book 5 of the Canon law of the Aristotelian and Roman Holy Church bearing the title of De Sanctae Sedis summo administratione, defined and listed below. The amended articles override the articles of the Canon Law prior to the current edict. - Article 7.1 : The Camerlengo is elected by all the cardinals from among the Roman cardinals elector for six months. - Article 7.1 : The Camerlengo is elected for six months by all the cardinals from among the congregational cardinals. The Camerlengo takes office every April 1st and October 1st. * Article 7.1.1 : Any Roman congregational cardinal appointed to this last office at least six full months before the first round, is eligible. * Article 7.1.1.1 : In case no candidate is found that respects the condition given in 7.1.1, it is possible to extend the list of candidates to all Roman congregational cardinals, with no condition of duration of office. In case this is still not enough, the list can be extended to all elector cardinals, and finally to the complete College of Curia. * Article 7.1.2 : All eligible candidates respecting Article 7.1.1 (or 7.1.1.1) are automatically in competition. Nevertheless, they can voluntarily withdraw before any of the rounds. * Article 7.1.3 : Every cardinal of the Roman Curia can vote, whether the cardinal is a national, roman, elector, suffragan or emeritus cardinal. * Article 7.1.4 : The election of the Camerlengo can be done in a maximum of 4 rounds. To be elected, a candidate must collect an absolute majority of votes (N.B. : Rules in Can-I-5 4.2.1 are in effect). * Article 7.1.4.1: A quorum strictly larger than fifty percent (50%) of the cardinals able to vote is required for an election at the first round. No more than 2 candidates can qualify for the fourth round, if it takes place. * Article 7.1.4.3 : When no candidate meet the threshold in percentage of votes, the two candidates with the highest percentage of votes are qualified for a final round. * Article 7.1.4.4 : Ties are resolved by discarding as many cardinals as necessary to meet the requirements of the above articles, starting with the most recently appointed candidates in the curia. - If the total number of votes cast is even : half of the total votes, plus 1. - If the total number of votes cast is odd : half of the total votes rounded to the next higher number. Amendments written and published by His Eminence Arnault d'Azayes, cardinal-camerlengo, the XIth day of the month of June, on Thursday, of the year of grace MCDLXIII. Wishing the Canon Law of our Holy Mother the Church is coherent and grow heavy with secondary laws adn regulations, and respecting Can 5.6-III-A-12 which give to the Pontifical Colleges of Heraldry the responsability to make an inventory and to present « a list of ornaments reserved for the clergy and the Universal and Roman Aristotelian Church », We, Cardinals gathered in Sacred College, ruled and ordered, and by our present edict perpetual and definitive, we rule and order the adoption of amendments relative to the Book 5 of the Canon law of the Aristotelian and Roman Holy Church bearing the title of De Sanctae Sedis summo administratione, defined and listed below. The amended articles override the articles of the Canon Law prior to the current edict. The main part of the modifications consists to remove references to heraldic ornaments of cardinals in Can 5-II. *Article 1.2.1 : The Aristotle medallion is gold, surrounded by a crown of laurels of the same. *Article 1.2.2 : The heraldic ornaments are defined as follows : the escutcheon is placed on two keys in saltire, one gold, one silver, linked by a cord of gules. 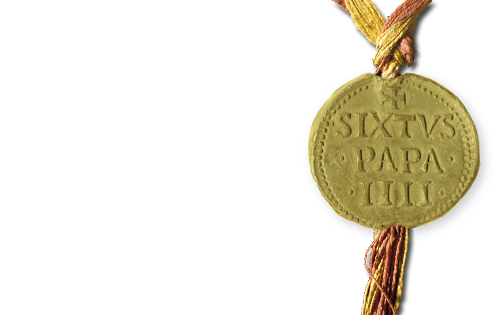 The coat of arms is also placed on a processional cross with triple-crossbars and the pallium. 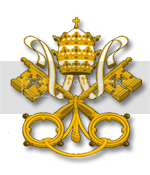 Finally, it is surmounted by the papal tiara adorned with three crowns. - Article 1.2 : The Aristotle medallion is gold, surrounded by a crown of laurels of the same. *Article 4.2.1 : The Aristotele medallion is scarlet. *Article 4.2.2 : The heraldic ornaments are defined as follows : the escutcheon is topped with a hat of gules, with fifteen hanging tassels on each side (1, 2, 3, 4 and 5) and is placed on a processional cross. If he is an Archbishop, he wears the pallium. - Article 4.2 : The Aristotele medallion is scarlet. *Article 5.2.1 : The Aristotele medallion is scarlet. *Article 5.2.2 : The heraldic ornaments are defined as follows : the escutcheon is topped with a hat of gules, with ten hanging tassels on each side (1, 2, 3 and 4) and is placed on a processional cross. If he is an Archbishop, he wears the pallium. - Article 5.2 : The Aristotele medallion is scarlet. *Article 7.7.1 : The Aristotle medallion is scarlet, surrounded by a crown of laurels of gold. *Article 7.7.2 : The heraldic ornaments are defined as follows : the escutcheon is topped with a hat of gules, with fifteen hanging tassels on each side (1, 2, 3, 4 and 5) surrounded by two stoles and is placed on a processional cross double-crossbars. If he is an Archbishop, he wears the pallium. - Article 7.7 :The Aristotle medallion is scarlet, surrounded by a crown of laurels of gold. *Article 8.5.1 : The Aristotele medallion is scarlet. *Article 8.5.2 : The heraldic ornaments are defined as follows : the escutcheon is topped with a hat of gules, with fifteen hanging tassels on each side (1, 2, 3, 4 and 5) and is placed on a processional cross. If he is an Archbishop, he wears the pallium. - Article 8.5 :The Aristotele medallion is scarlet. *Article 9.3.1 : The Aristotele medallion is scarlet. *Article 9.3.2 : The heraldic ornaments are defined as follows : the escutcheon is topped with a hat of gules, with ten hanging tassels on each side (1, 2, 3 and 4) and is placed on a processional cross. If he is an Archbishop, he wears the pallium. - Article 9.3 : The Aristotele medallion is scarlet. Given and confirmed at Rome by the Sacred College under the pontificate of the Holy Father Innocent VIII the XXXI of May, on Sunday, of the year of grace MCDLXIII. Amendments written by His Eminence Endymion d'Abbadie, Cardinal, published by His Eminence Arnault d'Azayes, Camerlengo, the thirteen day of the month of June, on Saturday, of the year of grace MCDLXIII, day of the commemoration of the Elevation Of Christos. Wishing the Canon Law of our Holy Mother the Church is coherent follow the realty, having token note of the evolution of several roman dicasteries and wishing the Canon Law to follow this evolution, We, Cardinals gathered in Sacred College, ruled and ordered, and by our present edict perpetual and definitive, we rule and order the adoption of amendments relative to the Book 5 of the Canon law of the Aristotelian and Roman Holy Church bearing the title of De Sanctae Sedis summo administratione, defined and listed below. The amended articles override the articles of the Canon Law prior to the current edict. - Article 3.4 : The Pontifical Chancellery or Roman Chancellery is considered as a fully-fledged congregation. -Article 6.2: The number of congregational cardinals is fixed at twice the number of congregations, plus two. - Article 6.2: The number of congregational cardinals is fixed at thirteen. Given and confirmed at Rome by the Sacred College under the pontificate of the Holy Father Innocent VIII the VI of August, on Thursday, of the year of grace MCDLXIII. Amendments written and published by His Eminence Arnault d'Azayes, Cardinal-Camerlengo, the sixth day of the month of August, on Thursday, of the year of grace MCDLXIII, day of the Saint Ariston de Ceos, fourth scolarch. Article 1 : Rome is the seat of government of the Universal Church. It is composed of various institutions : the roman dicasteries, the pontifical consistories and the colleges. Article 2 : In the exercise of his supreme, absolute and immediate authority over the Universal Church, the Roman Pontiff manages the dicasteries, consistories and colleges through the Cardinals, Chancellors and Prefects; it is in His name and by His authority that they fulfill their office. - Article 3.1 : The congregations are subdivided into different offices. These offices are under the supervision of the congregations to which they are attached. Article 4 : The College of Cardinals, or Sacred College, or Curia, is the supreme organ of the Roman Aristotelian Church. It includes all the cardinals, whatever their nature or offices. - Article 4.1 : The Curia take its decisions by consensus or through a vote. - Article 4.3 : The voting period may be reduced to 24 hours in the case of an urgent measure or increased to 10 days for an important measure. - Article 4.4 : The urgent or significant nature of a measure is the responsibility of the Camerlengo or the Archdeacon of Rome. Article 5 : Any linguistic area counting more than 10 parishes or 4 dioceses is raised by the Curia to the rank of geodogmatic area. However, the Curia can anticipate this elevation and grant that rank to a linguistic area of a smaller size if the need arises. - Article 5.1 : A linguistic area is composed of the parishes in which the faithful speak the same language. - Article 5.2 : A geodogmatic area is headed by a pontifical consistory. - Article 5.3 : The linguistic areas which are too small to become geodogmatic areas are led directly by the Curia which can, if necessary, appoint a pontifical legate on site. - Article 5.4 : The Curia can also temporarily annex a linguistic area to a nearby geodogmatic area or temporarily combine several linguistic areas into a single geodogmatic area. Article 6 : The pontifical consistories are collegial linguistic subdivisions of the Curia. They have authority over the geodogmatic area for which they are responsible. They are composed of at least one national cardinal elector. - Article 6.1: Each pontifical consistory is composed of a variable number of cardinals, whose nature is also variable. - Article 6.4 : The mission of the consistories is to maintain the dogmatic unity of the faithful and to manage the linguistic and cultural characteristics of the faithful under their jurisdiction. - Article 6.5 : The pontifical consistory may legislate and make decisions in their areas of expertise as described in the statute of each consistory and approved by the Curia and in accordance with Canon Law. Article 1 : The Supreme Pontiff, or Pope, as the direct representative of Jah on earth, is the supreme head of the Universal Church. The Pope has all the accumulated rights and powers of the other clerics. The Supreme Pontiff edits and promulgates papal bulls that have perpetual and irrevocable value. The material cause = The Pope must be a cardinal titular when he is appointed. There can not be another Pope in office. The efficient cause = The Pope is appointed by the College of Cardinals elector, suffragan and emeritus. The formal cause = The Pope is enthroned by the Camerlengo or the Archdeacon of Rome. The final cause = The Pope is the highest authority of the Church and chairs the Sacred College. - Article 1.2 : Article 1.2.1: The Aristotle medallion is gold, surrounded by a crown of laurels of the same. Article 2 : The Cardinals make up the Curia, the highest organ of government of the Holy See. - Article 2.1 : The Cardinals act collectively and their decisions must be validated, even retrospectively, by the College of Cardinals. - Article 2.2 : The Cardinals can celebrate all the sacraments of the Aristotelian Church. - Article 2.3 : The Cardinals are the only ones authorized to pronounce excommunication. - Article 2.4 : The Cardinals are the only ones able to validate a separation or annulment of marriage. - Article 2.5 : The Cardinals are the only ones able to validate a defrocking, whether voluntary or not. - Article 2.6 : The Roman Cardinals have a right to veto any decision taken by a member of the clergy apart from the Pope, National Cardinals have a right to veto any decision taken by a member of the clergy of the geodogmatic area dependent on their pontifical consistory apart from the Pope. - Article 2.7 : The title of Cardinal does not prohibit any cumulation with other offices in the secular or regular clergy. - Article 2.8 : They cannot be considered military although they may lead or command armies. - Article 2.9 : Cardinals who are absent for over a month without having warned of their absence may be appointed as emeritus and be replaced. If they make an appearance within a period of a month after their appointment as emeritus, they have priority over any unfilled cardinal position, notwithstanding the practice relating to the admissions to the Curia. Article 3 : The Cardinals are divided into several categories according to their nature and status. They can be elector or suffragan, roman or national. Article 4 : The Cardinals elector are entitled to vote in the Curia and have access to all palaces, assemblies and roman colleges. The material cause = They must be titular bishops or hold any other office with the rank of bishop when they are appointed. The efficient cause = They are appointed by the College of Cardinals or directly by the Pope. The final cause = They are a member of the Curia with the right to vote. - Article 4.2 : The Aristotele medallion is purple. Article 5 : The Cardinals suffragan are only entitled to speak in the Sacred College. They have limited access within the palace, assemblies and roman colleges. - Article 5.2 : The Aristotle medallion is purple. Article 6 : The Roman Cardinals have an universal responsibility. - Article 6.1 : The Roman Cardinals are divided between congregational cardinals (elector) and cardinals emeritus (suffragan). -Article 6.2: The number of congregational cardinals is fixed at thirteen. -Article 6.3 : Congregational cardinals have specific functions and are chosen by the Curia on the basis of their ability to perform these functions. Article 7 : The Camerlengo is the direct representative of the Curia. The Camerlengo can speak in the name of the Curia and is only accountable to the Holy Father and the College of the Cardinals elector. - Article 7.2 : The Camerlengos cumulate the rights reserved to Roman Cardinals in addition to their own. - Article 7.3 : The Camerlengo in the absence of the Pope and the Constable appoints the supreme commander of the Holy Armies. - Article 7.4 : The Camerlengo appoints the Archdeacon of Rome and establishes their responsibilities. - Article 7.5 : There cannot be more than one Camerlengo in office, and whoever is in office loses their title upon the appointment of their successor. The material cause = They must be a titutlar roman cardinals for 6 months when they are appointed. The efficient cause = The are appointed by the College of Cardinals elector and suffragan. The formal cause = The are enthroned by the outgoing Camerlengo or Archdeacon of Rome. The final cause = In the event of absence or of incapacity of the Pope, they stand in as the representative of the Church. - Article 7.7 : The Aristotle medallion is purple, encircled by a laurel wreath of gold. Article 8 : Archdeacond of Rome are the seconds representatives of the Curia. They assist the Camerlengos in their task, essentially intra-muros, and they substitute for them in the event of absence with all the legal powers of representation, chair or vote. 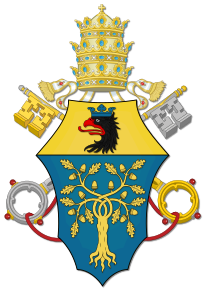 - Article 8.1 : The Archdeacon of Rome cumulates the rights reserved to the roman cardinals in addition to their own. - Article 8.2 : In the event of resignation or death of the Camerlengo, the Archdeacon takes the office, mandate and title of the latter, then appoints a new Archdeacon. - Article 8.3 : There cannot be more than one Archdeacon of Rome, and whoever is in office loses their title on the appointment of the new one. The material cause = They must be a titular cardinals when they are appointed. The efficient cause = They are appointed by the Camerlengo. The formal cause = They are installed by the Camerlengo. The final cause = In the event of absence or incapacity of the Camerlengo, they stand in for them with all the legal powers of representation, chair or vote, until the resolution of the incapacity of the Camerlengo. - Article 8.5 : The Aristotle medallion is purple. - Article 9.1 : The cardinals emeritus may be roman or national according to the statutes (roman or national) that they had during the exercice of their duties. The material cause = The roman cardinals emeritus must have been cardinals elector correctly and consistently for more than 12 months. The national cardinals emeritus must have been cardinals suffragan correctly and consistently for more than 24 months. - Article 9.4 : The Aristotle medallion is purple. Article 10: The national cardinals have the mission of managing their geodogmatic area. - Article 10.1: National cardinals are appointed by the Curia on the proposal of a Roman Cardinal or members of the existing pontifical consistory. - Article 10.2: The national cardinals are assigned to the pontifical consistory of the geodogmatic area from which they come from. Given at Rome under the pontificate of the Holy Father Eugene V, the first day of August, on Tuesday, in the year of grace MCDLV. Last modification and endorsement by the Sacred College of Cardinals on the sixth day of August, on Thursday, in the year of grace MCDLXIII. Published by His Eminence Jeandalf the first of August, on Tuesday, in the year of grace MCDLV ; amended, revised, corrected & published by His Eminence Maisse Arsouye the seventh of the month of March, on Friday, the day of Saint Thomas, in the year of grace MCDLVI ; amended, revised, corrected, published again and sealed by His Eminence Aaron Nagan, Cardinal-Camerlengo, the twenty-first of the month of November, on Friday, in the year of grace MCDLVI of our Lord ; amended by His Eminence Aaron Nagan, Dean of the Sacred College & published by His Eminence Cyril of Kad Azayes, archdeacon of Rome, on the twelfth day of the month of July, on Monday, in the year of grace MCDLVIII ; amended & published by His Eminence Cyril Kad Azayes of the eighth day of the month of August, on Tuesday, in the year of grace MCDLX ; amended, revised, corrected, published and sealed by His Eminence Aaron Nagan, Cardinal, Dean of the Sacred College & Archchancellor of the Apostolic See, the eleventh of the month of November, on Friday, in the year of grace MCDLXII of Our Lord ; amended, revised, corrected, published and sealed by His Eminence Arnault Azayes, Cardinal-Camerlengo, the sixth of the month of February, on Friday, in the year of grace MCDLXIII of Our Lord ;amended, revised, corrected, published and sealed by His Eminence Arnault Azayes, Cardinal-Camerlengo, the eleventh day of the month of June, on Thursday, in the year of grace MCDLXIII of Our Lord; amended, revised, corrected, published and sealed by His Eminence Arnault Azayes, Cardinal-Camerlengo, the thirtennth day of the month of June, on Thursday, in the year of grace MCDLXIII of Our Lord; amended, revised, corrected, published and sealed by His Eminence Arnault Azayes, Cardinal-Camerlengo, the sixth day of the month of August, on Thursday, in the year of grace MCDLXIII of Our Lord..